Jan. 21, 2019, Pensacola, Fla. 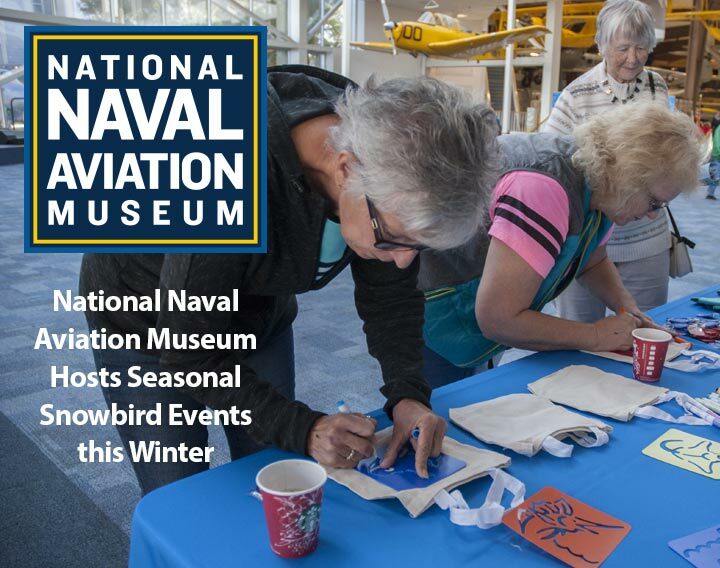 The National Naval Aviation Museum, located aboard Pensacola Naval Air Station, welcomes winter visitors with several seasonal events this January and February. To kick things off, the Museum is hosting its annual Snowbird Fly-In Expo on Tuesday, Jan. 22 from 10 a.m. to 12 p.m. Winter visitors are invited to receive information from local organizations, enjoy coffee and a concert from the Blue Anchor Belles. Interact with exhibitors from the Naval Aviation Museum Foundation, Visit Pensacola, Santa Rosa Island Authority, Pensacola Beach Chamber of Commerce, Perdido Key Chamber of Commerce, Pensacola Lighthouse and Museum, Naval Hospital Pensacola and Keep Pensacola Beautiful. Don’t forget to get your photo taken in front of our special Blue Angels backdrop. Grab your friends and family and have them join in. Photos will be uploaded to the National Naval Aviation Museum’s Facebook page to download, print or share with your friends and family. The Snowbird Fly-In Expo is free and open to the public. Next up, every Tuesday in February visitors are invited to enjoy Chick-fil-A breakfast and choice of beverage from the new refreshment counter followed by a presentation and movie in the Giant Screen Digital Theater.